Making connections between personal interests and practical skills is essential to advancing as a professional, and in distinguishing your personal brand in a job market saturated with carbon copies. This growth requires positivity and a willingness to continually learn, as argued in a previous article. In my own career “the skills that have led to further opportunities for me as an educator stemmed from personal interests—reading and writing, technology, and design”. Even the most unlikely of personal pursuits can lead to surprising opportunities as you learn to apply them in differing contexts. I’m a big aficionado of fantasy in all its forms. From having The Lord of the Rings read to me as a child to slashing wildly at dragon bushes with wooden swords, I’ve always been inspired by far away worlds. Little did I suspect that my interest would one day lead to much more. In 1998 Bioware, known best for the Mass Effect series, released Baldur’s Gate, a video game based on the Dungeons & Dragons Forgotten Realms setting. Immensely popular, it sparked a role-playing game renaissance, in part because of the ability to customize portions of the gaming experience by adding your own images and sounds. 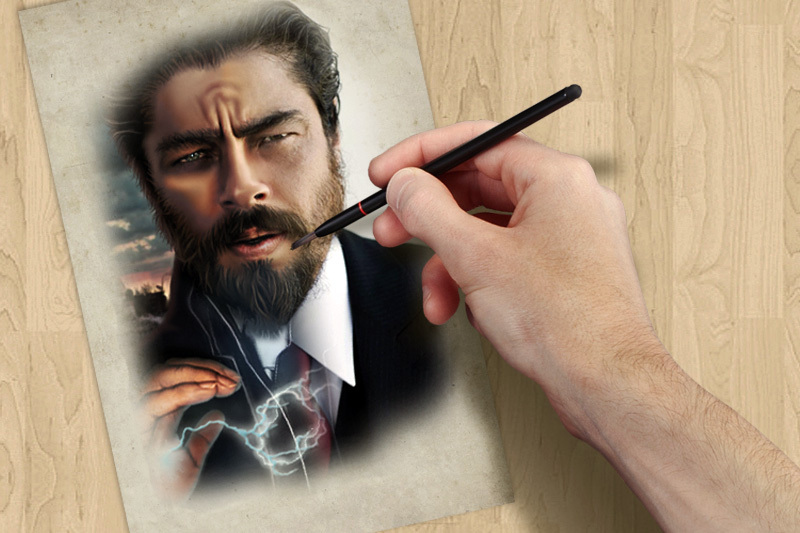 This naturally led to many fans creating custom portraits that were most often images of celebrities edited through photo manipulation to suit the fantasy setting. When a small company called Overhaul Games decided to rerelease Baldur’s Gate for modern computers with technical updates and new content, I and many other fans were ecstatic. Imagining the characters I would create, I again thought back to the first fan-made portraits I had seen. I had used Photoshop a bit for work, so why not manipulate photos to make my own images? It didn’t go as well as I had hoped. Though I had taken art courses in high school, I was never a great artist, and my efforts always felt inferior to my more talented friends. Looking back to my first portraits, they certainly didn’t even begin to approach the oil-painted feel of the game’s original art, and instead resembled watercolored monstrosities. Undeterred, and supported by a wonderful community of fellow fans, I continued to refine my work. A year and a half later, my portraits barely resemble those first efforts, and reflect a style developed through experimentation and constructive feedback from others. The tedious task of learning was not tedious at all; I found that I enjoyed the challenge of piecing together photos and transforming them into new works of art. More pertinent to the topic at hand, I had developed an entirely new skill that wasn’t limited to fantasy. As I began to produce more and more portraits for the game, it quickly became apparent that the many members of the Baldur’s Gate forum were just as passionate as I was in continuing to build content for the game. To house the many completed pieces, I created a website repository where they could be easily browsed and downloaded. Though I now rarely have the chance to update it or visit the forum, the learning process I went through, and the interactions with the forum members, made a strong impact on me as a designer. By learning to create portraits for a game, I haven’t merely fed a personal passion. I’ve steadily developed a better eye for graphic design and vastly improved my skills in Photoshop. I was inspired to create a non-traditional résumé that drew responses from several companies, including my current employer. A better understanding of design principles and practices also enables me to avoid outsourcing, improve marketing efforts and better manage our design staff. On a broader scale, my earlier passion for fantasy novels and games enabled me to build much stronger skills in communication and technology. Reading, gaming and other hobbies can contribute to the development of numerous practical skills, from research and copywriting to web design and computer repair. Similarly, they often lead to positive emotional effects and positively correlate to higher work performance according to studies. Dedicate yourself to mastering your passion. Whether painting, graphic design, music, literature, travel, photography, gaming or any other hobby, try something new and immerse yourself in it. Spend time and effort to develop a better understanding of its qualities and merits, and connect with others who share that same interest. Learn more about its applications. Investigate how businesses are built around your interest. This is often not as difficult as it sounds. Music plays a significant role in affecting consumer behavior, employee travel is a large cost for many businesses, and gaming generates billions in revenue each year through research and marketing. Every hobby has roots in an industry with particular needs. Connect it to a professional skill. As you develop your new abilities, think of creative ways in which you can use them. If you have a passion for travel, keep a travel blog and improve your writing skills, or learn more about the best ways to reduce travel costs. If you enjoy photography, begin developing a portfolio of images that relate to your profession. As you make the connections, it becomes easier to recognize its functional value. Apply it to your work. Excluding highly specialized professions, we no longer live in a world in which a narrow spectrum of abilities is sufficient. The employees who are most valued are often those who possess diverse technical and soft skills, and are able to effectively manage others by drawing upon unique talents. Innovation comes through application of knowledge and approaches that others have not tried. Encourage others in their passions. As with all other areas, I firmly believe personal and professional growth is often social. Support colleagues as they also try new pursuits, and be positive and constructive about their progress. By doing so you build trust, camaraderie and support. Our lives need not be in a perpetual dichotomy, and bridging your work and home life is not always negative. Personal passions represent an integral part of who you are, and transferring those passions into your professional life, building career skills, can bring unexpected rewards…even if you’re simply painting orcs.